The SAAB 37 Viggen was an aircraft ahead of its time. Its designers used an unorthodox construction which enabled the plane to meet all requirements which had been laid on it and in some parameters even surpass them. 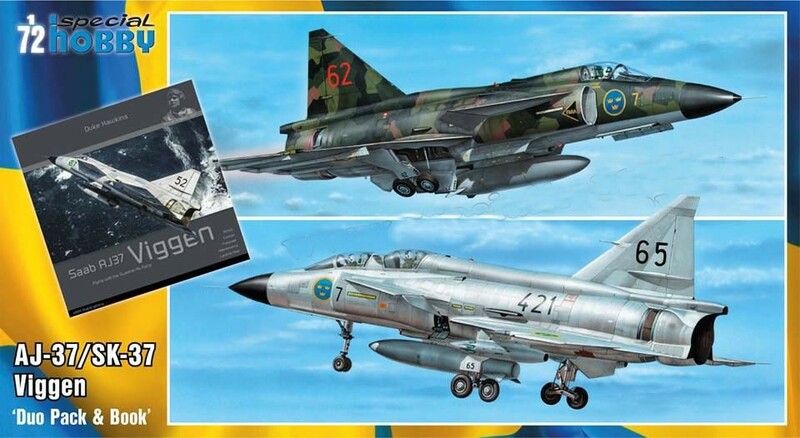 The Swedish Air Force ordered several various versions of the Viggen jet fighter, its basic design formed an universal platform which, using a specialized equipment, enabled the plane to be used for different roles. The first of seven prototype machines took off for its maiden flight on 8 February 1967 with E.Dalström at the controls. The aircraft was powered by a Volvo RM8 turbofan, a licence-built variant of the Pratt & Whitney JT8D with an afterburner and thrust reverser which, in addition to a double-delta wing design, enhanced the plane’s performance the take offs and landings on short airstrips. The avionics of the Viggen was state-of-the-art at the time, the Viggen was the first type to be equipped with a computer with integrated circuits. The first version of the Viggen to see service with the Flygvapnet was the AJ 37 strike fighter followed consequently by the SK 37 two-seat trainer, the SF 37 reconnaissance version with cameras in a redesigned nose section and the anti-shipping SH 37 with much differing avionics, capable of carrying a range of anti-shipping weapons. Ten years after the first Viggen version entered service, the second generation of the SAAB, the JA 37 dedicated fighter machine came into being. Up to date avionics was used and also a more powerful engine in a slightly longer fuselage. The earlier version got this updated avionics too and this way the AJS, ASFS and ASHS 37 versions were created. A certain number of the two seat airframes were converted to the SK 37 E electronic warfare trainers. And that is just the electronic warfare verison, in Sweden also known as the Stör-Viggen, that we are going to bring you in the shape of the currently reboxed 1/48 Viggen kit. The model contains 11 sprues accompanied by photo-etched details both for the exterior and interior of this verison. The decal sheet and marking schemes cater for three various machines, two of which had the standard splinter-type camouflage scheme made up of several colour shades, the final marking option flew in two grey scheme and had rather dramatic lightning bolt on its tail fin.